If you can’t learn, you can’t thrive. if you can’t produce, you can’t thrive. “Deep Work: Rules for Focused Success in a Distracted World” is a masterful book in helping us get every last drop of value out of our intellects in this distraction-filled world. 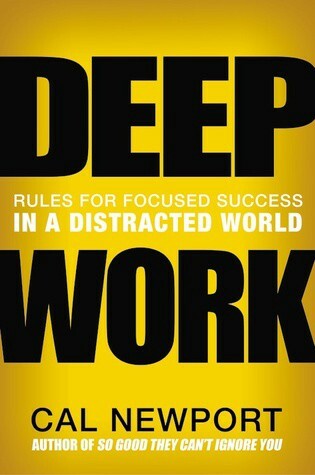 The author, Cal Newport, defines ‘Deep Work’ as those professional activities performed in a state of distraction-free concentration that push your cognitive capabilities to their limit. These efforts create new value, improve your skill, and are hard to replicate. In contrast, ‘Shallow Work’ is defined as non-cognitively demanding, logistical-style tasks, often performed while distracted. These efforts tend not to create much new value in the world and are easy to replicate. Now that we have got the core definitions out of the way, let us get into the core thinking. One of the fundamental tenets of this book is that we are in a complex information economy that changes rapidly. To survive, we must learn to master complicated subjects quickly and produce high quality work as soon as possible. Doing this is next to impossible in this era of distractions unless we equip ourselves with the right skill sets. The next hypothesis is that we have lost the battle for our time to network tools (Email, SMS, meetings, social media, etc.) and that we have done little to solve this insidious problem. Network tools are the primary source for shallow work, leading us to forget what ‘Deep Work’ is actually about. The author calls this the Deep Work Hypothesis — the ability to perform deep work is becoming rare at exactly the same time it is becoming increasingly valuable in our economy. So Why Should We Care about ‘Deep Work’? High Quality Work is a function of the time spent and the focus given to it. When we multi-task constantly (checking emails, social media, etc. ), we develop a lot of attention residue and break the flow. So the focus keeps fluctuating up and down, leading to poor quality output. The other reason for Deep Work (which keeps us in the flow) is that we are happiest when we voluntarily immerse ourselves in challenging physical or mental activities. As knowledge workers, there is ambiguity about the tasks we do and the value they add to the bottom-line. For example, it is relatively easy to understand the value a sale brings in while it is far harder to understand how an email or a presentation adds value personally or to the organization. It is this lack of feedback which makes us gravitate to behavior which are easiest at the moment i.e. answering an email or attending a status meeting. The author calls this the “Principle of Least Resistance”. Similarly, in absence of these indicators, we tend to do a lot of visible shallow work (Busyness as Proxy for Productivity). ‘Deep Work’ has two parts. The first part explains why ‘Deep Work’ matters and the second part gets into how to start ‘Deep Work’. The structural flow is logical and sections flow seamlessly into one another. This appeals to a person like me (with a strong left brain) and makes it easier to digest. The action plan is constructed in a pragmatic fashion that will let people get into ‘Deep Work’, build up their mental muscles and get away from distractions. Cal Newport has used examples and anecdotes liberally to get the point across. In addition, the amount of research and cites is mind boggling. I found a lot more material to read from the cites themselves. One of the outstanding features of ‘Deep Work’ is in how Cal Newport has tied a lot of threads together. These threads (for example: ‘Flow’ by Mihaly Csikszentmihalyi or ‘The 4 disciplines of Execution’ by Chris McChesney ) are from a multitude of sources and seeing them come together to support the reasoning, is a joy in itself. The author is not afraid to challenge existing paradigms and other organizational myths. He presents an alternate perspective on why these succeed and how ‘Deep Work’ can work in these place. For example: instead of an open space office which implies more collaboration, he suggests using a hub and spoke model for better output. This is corroborated by research at MIT and Bell Labs. There are three takeaways for me. I can now better understand why organizations and roles are the way they are. I can also put structure to a lot of unconscious ‘Deep Work’ rules I was following before. This book has also helped me realize that I have lost some of the razor-sharp focus in the last few years and how to get it back. I spent a lot of time curled up with this book going back and forth to grok it. The introduction hooked me on to it and I soon realised that this might be one of those all time greats I keep going back to. I am happy to say that book will have a permanent place in my library. Please buy the book since the author is much better at explaining than I ever will be. But if you want a gist of what he recommends, please continue reading. Make Grand Gestures — make a radical change and commit time, money, publicly etc. How to support your plan? Embrace Boredom — Don’t peek at your smartphone or browse when you have 5 minutes available. Focus on more important items. Instead of the ‘Any-Benefit’ approach, use the ‘Craftsman approach’ to network tools. Meditate productively — focus your attention on a single well defined problem when involved in a physical activity like walking or jogging. Flow is applicable even for your leisure activities.